Shanghai Calendar Girls, late 1920s? No source is given by Nelson for the image so it is impossible to say which dance they are dancing. It could be tango. ….which might mean that it is some other dance. The bobbed hair of the women, apart from the leader in the foreground who may have a marcel wave, the smart hotel Interior (compare with the interior of the Majestic Hotel shown in Field’s book) the western dress of the men all point to smart, western modernity. 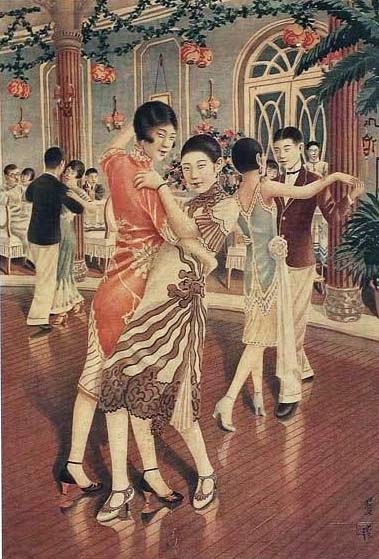 The women are flat-chested, a body shape ideal fashionable until the late 1920s.